One of the greatest champions in the history of cycling, Gino Bartali, could be made one of the “Righteous” in Israel. Almost 70 years after the events, and twelve years after his death, evidence is finally coming to light of his hitherto unknown actions during the Second World War, which helped to save the lives of 800 Jews. In 1943 Bartali, who had already won the Tour de France once and the Giro d’Italia twice, was assigned to the traffic police by the fascist regime, before leaving the job on 8 September. That was when he went underground, choosing to help persecuted Jews by smuggling identity photos to a convent that produced counterfeit papers. 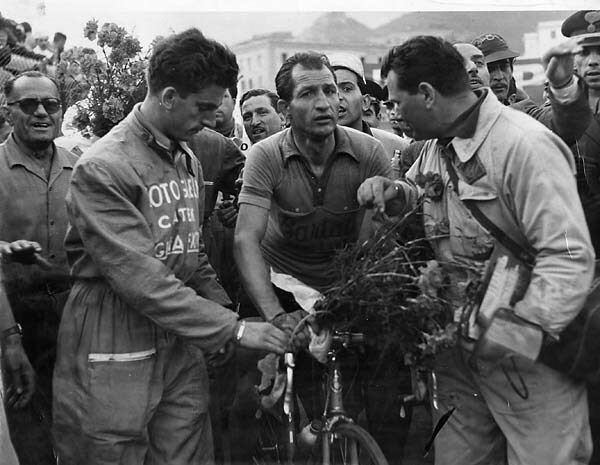 As far as the soldiers who guarded the road between Florence and San Quirico, near Assisi, were concerned, Bartali was merely on a 380-km training run. In fact, valuable documents were hidden inside the frame and saddle of his bicycle. Details about Bartali’s actions began to emerge just two or three years ago, thanks to a university research project that collected testimony from a nun, Holocaust survivors and their descendants. Andrea Bartali, his son, has continued this research with the support of the Jewish community in Tuscany and the journalist Laura Guerra . In Israel, the Yad Vashem Memorial is currently studying the evidence with a view to granting Bartali the posthumous distinction of “Righteous Among the Nations”, awarded to those who placed their lives in danger to save Jews. Towards the end of 1943 he was thrown into prison for 45 days, officially because of his support for the Vatican, which opposed the fascist regime. By chance he was never required to appear before the special war tribunal and was set free without trial. On his release he resumed his career and won a third Giro d’Italia and a second Tour de France, while the tifosi couldn’t get enough of his legendary rivalry with Fausto Coppi. The Fondazione Bartali has launched an appeal for testimony about Bartali’s actions to help Jews.